I bought a used trailer last Friday. Other than towing it back home full of groceries, I hadn’t used it. My panniers are falling apart, and I hadn’t ridden my folding bike in months. 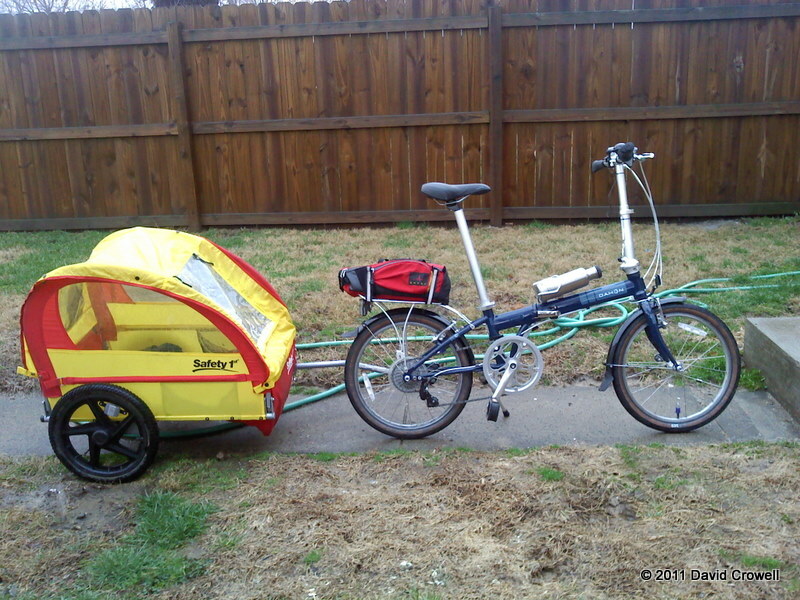 So I put my commuting gear in the trailer, and towed it with the folding bike. Parking in the office was a pain, but the rain cover kept my stuff dry. I don’t intend to normally ride it to work, as I have new panniers on the way, but I probably will tomorrow for the Car-Free Happy Hour. I hadn’t looked at the pictures of the one on CL. I see. I thought part of the reason you posted it was because it was the same as yours. Now I just need to rig up SuperFlash mounts like you have. I can order the SuperFlash brackets for you. I think they are about $5 each. OTOH, the Portland Design Works Radbots I bought for the Vienna came with such brackets. I’ll have the Vienna with me tonight. Do the brackets just bold to the existing reflector brackets? I have the same exact trailer! I bought it off of Craigslist two months ago for 30 dollars, and I’m happy with the investment. Two friends and I have never toured before, but we’d like to get into it. On Monday, we’re leaving from Middletown to Lexington and staying the night in a hotel. The next day, we’ll ride around and camp out somewhere near Frankfort. On the third day, we’ll return home. 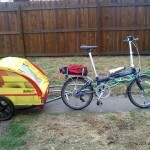 We’re taking the trailer and it’s going to make things a lot easier. Now we have plenty of room for a full-size pump, (hand pumps are a pain to me), extra clothes, and other things we wouldn’t normally bring if we were just using the panniers on our rear racks. 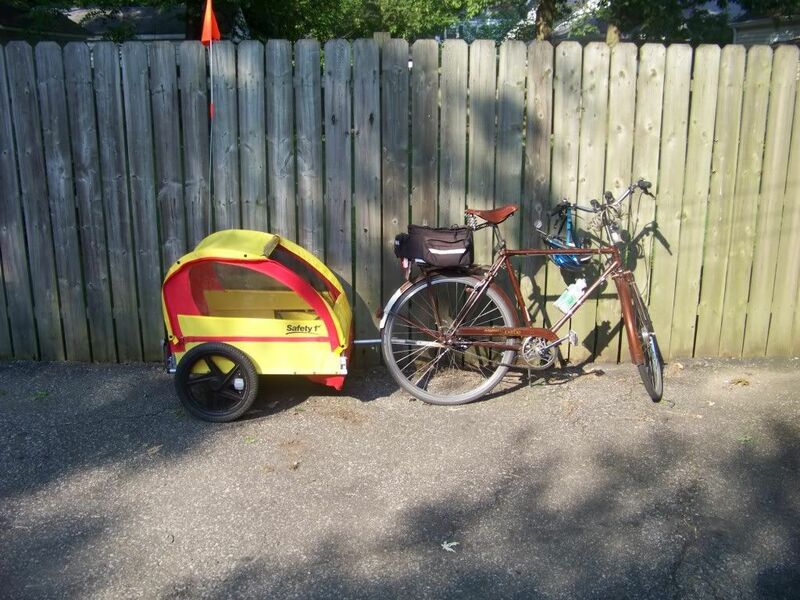 Plus, whenever I ride on Preston with that trailer behind me, people give me tons of room. Maybe it’s the sticker that says “Baby on Board” or something.